Selling on Amazon is a real business opportunity. Provided you go into it armed with research and prepared to put in the upfront hours to get started, you will reap the long-term benefits of running a legitimate and profitable business. Some of the benefits of an Amazon FBA business, in particular, are that once you are up and running, it’s a relatively passive income. You rely on Amazon’s fulfillment service to manage your inventory, and once your products are launched and making money, the ongoing tasks can be pretty low maintenance compared to other business models. You can also hire a VA (virtual assistant) who is well versed with Amazon tasks that you don’t have the time to do yourself. But as the realm of third-party selling on Amazon grows, so do some of the ‘rules and regulations’ that are required from you. But it’s not all bad news. These are just considerations that all real businesses have to make. In this article we’re going to take a look at one of the most important decisions facing Private Label Amazon sellers right now… Trademarks and Amazon brand registry! Real Businesses Have Real Problems! Along with the territory of running a business, there are always some legal, admin and financial considerations. 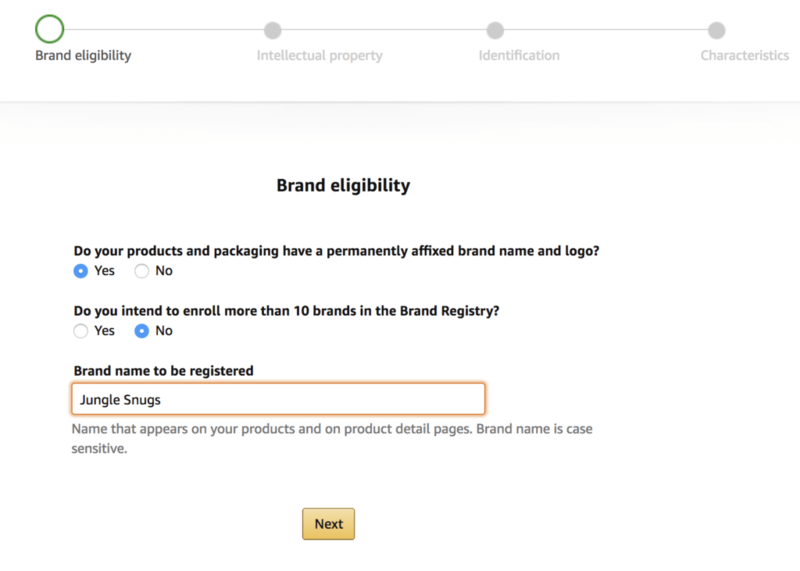 One of the most recent bigger changes Amazon have made was to their Brand Registry program, which now requires you to have a registered trademark for your brand to enter. It was good while it lasted, folks. But let’s not get into a panic or a frenzy. If you haven’t already started thinking about getting registered trademarks for your products, let’s start thinking about this now. We’re all in this together! To find a product to sell on the Amazon marketplace, get the Jungle Scout Chrome Extension. Do you need to register your brand? When I last wrote about this topic, a lot of sellers were still in two minds about whether they should enter the Brand Registry or not. In my opinion, things are fast shifting towards Brand Registry becoming a must have for serious Amazon sellers. It’s definitely not a requirement, and I would still fully recommend to launch your products without it. But what you should be doing is planning ahead for getting a trademark, because for your most important products, it’s going to be a really useful tool to have on your side. Probably the biggest new thing that Amazon sellers have had to contend with over the past 6 months is the concept of having to get a trademark. Many sellers have no experience in this area (myself included), so it’s new territory. Although getting a trademark comes with associated costs and takes several months to process(! ), it’s not something that us sellers should be afraid of. We applied for some trademarks for some of the Million Dollar Case Study products, Jungle Stix and Jungle Snugs, back in 2017. Those trademarks took over 4 months to be processed, but they are now fully registered trademarks in the US, allowing us to enter those products into the Brand Registry. Result! So with this experience in mind, let me share with you some of my top tips for approaching trademarks as an Amazon seller. Disclaimer: I am in no way providing any legal advise. Instead, I’m sharing what we have found from going through this process with our own products. We would always recommend hiring a professional lawyer to help with this process. What you need to apply for a trademark. How to come up with a brand name. Pick a name that is creative and memorable, yet generic. Descriptive names are more difficult to trademark usually. Try brainstorming with a friend or family member. Sometimes other people’s ideas can help. Try not to stress about this too much. At this stage you just need a functional brand name that is available and that you can trademark so that you can start that process and get into the brand registry later on. Before you apply for anything, the one thing that you really need to make time for is research. One of the main things to research before settling on a brand name for your product is to check it’s not already a registered trademark – otherwise you’re not going to get very far with an application and at worst you could spend time and money, only to get your trademark application refused. It is actually quite easy to search the trademark database. 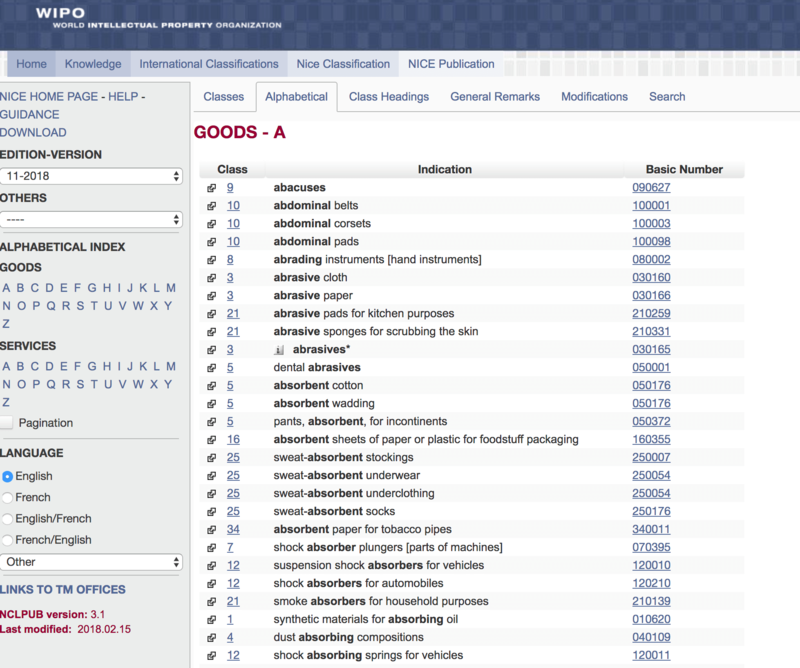 Here’s a guide on how to search the USPTO database for US trademarks. If you are searching in Europe you can use the EUIPO website to search. An additional old fashion Google search may also help to uncover if any companies or brands are using the name you wish to use. You can also hire a professional to help you carry out comprehensive trademark research. Companies such as Trademarkengine can help you do this, as well as help you with the application process itself. This may help you save time, as well as offer peace of mind. You want to find out if your brand name is already registered at all, and secondary to that, if it is, what International Classifications does it fall under? International trademark classes are also known as “Nice Classifications”. When you apply for any trademark, you will apply in one or several of these classifications. There’s a comprehensive list of all of the classes on the WIPO website, which can easily be searched by class, alphabetical by name and includes a detailed explanation of what each of the classes actually mean under the ‘Class Headings’ tab. Similar to researching if your brand name is available, you can either do this yourself directly by using the USPTO website or the EUIPO website to make an application. I have never tried this myself, but I have heard from sellers in our Facebook group that it’s very time consuming. For that reason alone, when we applied for the Jungle Stix and Jungle Snugs, we used Trademarkengine.com. It took a few months to process and get the registered trademarks as a result but this is completely normal for any application, no matter how you apply. One thing that may slow down progress considerably, is if your application is more complicated. For example, if there is a risk that the trademark you are applying for is similar to others, or used for similar products and services. For plain sailing, always try to apply for a trademark for a brand name that you have verified is available to the best of your knowledge. Tip: Hiring a lawyer who specializes in intellectual property law can be hugely beneficial to ensure your trademark application runs smoothly! When do I need a trademark? Well, there is no requirement to enter the brand registry at all. But for serious sellers it’s a consideration you should really be thinking about as soon as possible. 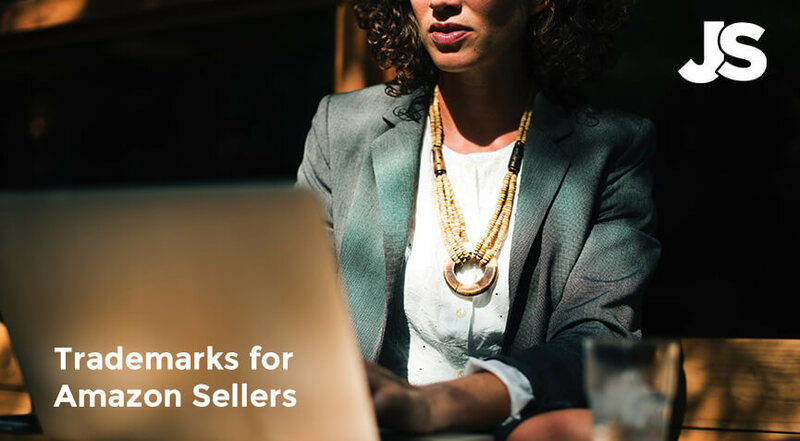 It’s totally understandable for sellers to avoid the expense and effort involved with applying for a trademark right away, if they first want to verify that their product is going to be a big seller. Of course, we always advocate spending a lot of time on your product research to minimize the risk of launching a product that does not go on to become one of your big earners. But even if you have done this, you’ve read the resources, you’ve used the tools, and really verified that your product idea is going to fly – you still may want to give it a good run before you invest in a trademark. But starting your research before you launch is still the best option. It would be a royal pain to have to rebrand your product down the line, redesign your packaging and update your Amazon listing. A little preliminary research on what brand name you decide to use goes a long way in ensuring you can get that trademark later, with as little hassle as possible. Again–it’s not a necessary requirement, but if you are serious about your product and Amazon business, then it’s going to be worth your while. Start the application on Seller Central’s brand registry website. Submit the application and wait. Note that to do this you need to log in to the Brand Registry website, rather then into your usual Seller Central account. You can use your usual account details and password to sign in. I recently went through this process with Jungle Stix and Jungle Snugs and I found out a few things along the way. Here’s how the application process goes step by step. Make sure that the brand name you enter here is the same as the one on your registered trademark certificate. Next you will need to upload product images. You can use your existing product photography, packaging photography and an image of your logo. Important: This is where my initial application got refused. I supplied photos of the packaging that displayed the Word mark (brand name), but I did not include an image of the Word mark and/or logo on the product itself. 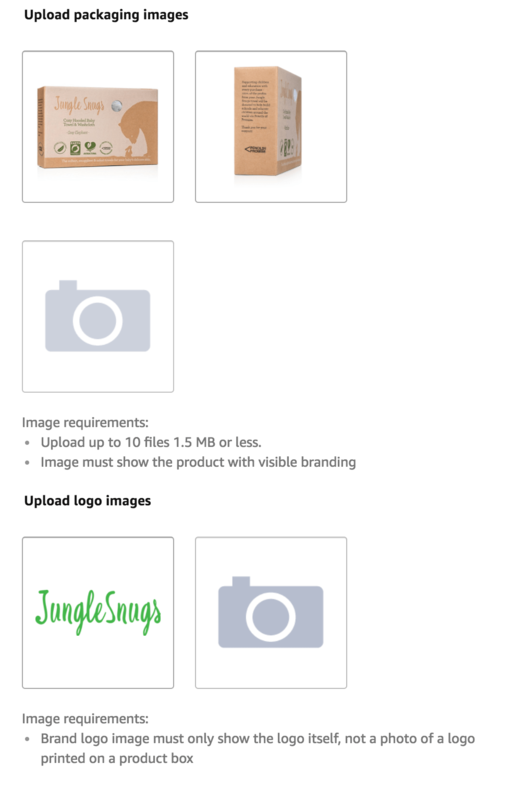 In this case, I had to resubmit my application with a photo of the Jungle Snugs logo on the fabric tag of the product. For Jungle Stix, we have a photo of the name etched into a bamboo skewer. Tip: Always submit images of your trademark brand name on the product itself as well as the packaging to get your application approved. This is where it gets interesting. If you want to create your own “Manufacturer Part Number” for your product and do away with your initial barcode (UPC or EAN) then you need to state that you do not have one, and then select your product category an the type of unique identifier that you want to choose. A good reason to do this might be if you used a third party barcode to launch your product. Right now it looks like Amazon are clamping down on the use of third party barcodes in favor of verified GS1 barcodes. We’re not sure if existing products will be forced to change their unique identifiers in the future, but one benefit of being in the brand registry is that you can create a listing without a GTIN or a GS1 barcode. After you have settled whether you want to ditch your original barcode, fill out the rest of this form. Optional fields can be left blank. Remember that as a private label seller, your brand effectively manufactures products and imports them to the country of sale. There is also an optional area to enter a website for your brand/product and social media links. This might indicate that Amazon are planning to require some of these things in future. Or perhaps they are just trying to scare us? Who knows! For the applications I entered the Jungle Snugs and Jungle Stix websites which are non-transactional, simple product websites. It did the trick for me. Drop your comments in this post if you have any experience with these optional fields! Once the application is complete you just need to hit submit and wait. In my experience it took a few days to process. 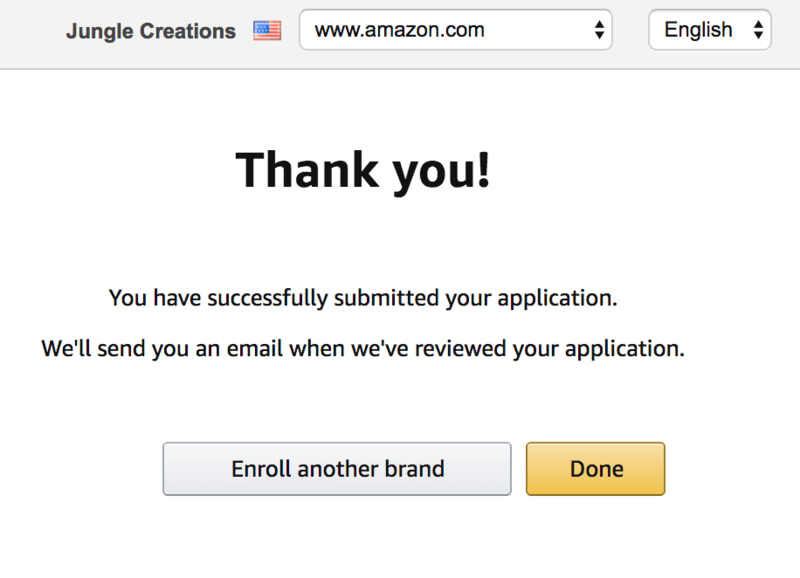 You can keep checking back by logging into the brand registry website to see if your brand(s) have been approved, but Amazon will also notify you by email to let you know if there were any issues with your application, or if it has been approved! One question that I see a lot is how do I manage trademarks and brand registry if I have multiple SKUs? It’s a good question. With each trademark coming with an associated cost and a pretty lengthy application and processing time, most sellers want to optimize as much as possible and avoid going through this same process several times. We have been advising sellers to go for a generic trademark for some time now, leaving the door open to use the same trademark for more than one SKU. So rather than the Jungle Stix trademark that we applied for, we could have gone for something more generic like “Jungle Creations“, and then have all the products in our catalogue use this brand name. I took to our Facebook Group to ask if any sellers have managed to do this successfully. As it turns out, many have done this, but there is one small caveat. You must still register your trademark in all relevant classifications. So if you sell products from entirely different niches that fall under different Nice classes, then you need to register your trademark for both of those classes. The easiest and most economical way to do this is to register for several classes at once. Depending on where you are applying, you can often add classes to your application to minimize the amount of admin work. If you already sell your product in multiple marketplaces or plan to do so in the future, this is a worthwhile consideration too. At the time of writing, the Amazon brand registry page for the US mentions that your trademark must be registered in the United States, Canada, Mexico, India, Australia, Japan, France, Germany, Italy, Spain, the UK or the European Union. Conversely, the brand registry page for the UK states that the trademark should be registered in France, Germany, Italy, Spain, the UK or by the European Union Intellectual Property Office. This means that for sellers looking to sell in the US and then move to Europe, it may be more beneficial to register a trademark in Europe, because this will allow you to access the brand registry in the US and in Europe. Something worth considering before you make an application! 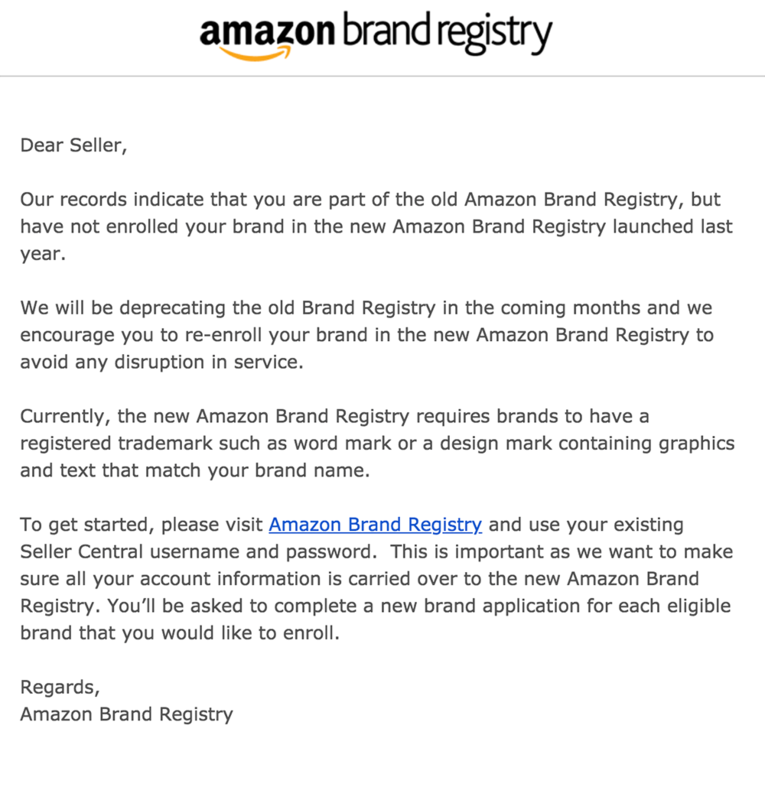 To round this Amazon seller trademark and brand registry update, the key pointers are that brand registry is not going away, and is becoming more important for private label sellers. The only way to enter now is to have a registered trademark, even if you were in the brand registry before this rule came into place. Though this makes the process more complicated, it is simply a part of owning a legitimate business with high growth opportunity. If you want to protect your private label products and your brand, whilst getting access to the best marketing tools on the Seller Central platform – then you are going to want to do your homework and start the trademark process. Let us know in the comments below your thoughts, questions or experiences with getting your products trademarked and into the brand registry! Hi, I have a registered trademark with my company. Can I register a second brand? If now for every company there is a brand and a showcase page, can I have a unique store name for each brand? It’s possible? Or can each company have only 1 brand? I don’t see any reason why you wouldn’t be able to have a second brand registered. I have two registered. As far as two seller accounts go, I think you have to get a special approval for that. Thanks for your answer. If I have a registered trademark on Amazon, I can have a showcase for that brand. But if you register another new brand, can I have a second specific showcase for the second brand? If I understand correctly, you’re asking about an Amazon Storefront for each trademarked brand? If both of your brands are registered to one Amazon account, you are not able to set up multiple storefronts within one Amazon account. If you need different storefronts for each brand, you would need to apply for a second seller account. You’ll need Amazon permission for a second account under a separate email. Thanks for this study, it’s really complex. I’m protecting my brands in European Amazon’s Marketplaces based on trademark protection given in EU. I’m wondering if I can enroll my brand into ABR on amazon.com, when I have registered my brand in EUIPO (european union intellectual property office) ? Do you know anything about that? I don’t have my American account yet, so I cannot check if the Amazon.com Brand Registry will pass my EU trademark. I’m not 100% sure, but I think you have to reregister with Amazon US. My trademark is activated and registered in Amazon Brand registry . How do I remove the hijackers sellers from my selling pages ? What exactly to write in the complain ? I have a quick question for those who might know: If I register our brand (larger brand) is it possible to allow third party sellers who are currently selling our product to continue doing so? I want to utilize the seller tools available by registering our brand, but I do not want to take the ability of third party seller away. Thank you to anyone who might know the answer!! I only have the product name and logo on the packaging, and not on the actual product. Is this going to prevent my trademark from being accepted by the brand registry program? I was only mentioning that I don’t have any UPCs in case it were important. Can anyone give their opinion on this situation please? 1. We have a UK registered trademark. 3. We are now ‘not enrolled’ in the version 2 of the US Brand Registry – but still have full access to enhanced brand features in the US. Given that we can link the UK trademark in with the US Brand Registry, it will ensure the enhanced brand capability. However, this UK trademark does not help us remove hiljackers on our US listings – or so we’ve been told since our trademark is not a US one. Can anyone confirm this inability to fight off hijackers given the above scenario? Many thanks for any help offered. Amazon’s pretty good about clearing out hijackers on active product listings. The only time I’ve come across hijackers in the last year or so is when my product runs out of stock. What if there are some products that I’m unwilling to put my trademark on, because the cost of adding it would decrease my margin too much? Would those remain regular listings with the “Generic” brand and without enhanced brand content? I sell glass (and plastic) soap dispensers and have no packaging other than the bubble wrap we use for shipping. Can a sticker with the trademark added on top of the bubble wrap be sufficient for the packaging requirement? If we are already selling products without a trademark, how do we make the transition? Is the following correct? : 1. We’re not allowed to print the symbol on our products until it is approved. 2. When we get the trademark, then we can start adding the trademark to the products and sending them out. 3. Then we get the Amazon brand registration. 4. Can we then switch the brand on the listing or do we need an entirely new listing? Great questions. A trademark and a UPC are two different things. UPCs are universal product codes, and you don’t need a trademark to add those. They make it so your product is easily scannable. Most retail stores require it, although you can get around it at Amazon thanks to their fnSKU system. UPCs are typically a one-time cost per year (I pay $250 for 10 UPC codes, plus $25 per year to keep them updated). Once amortized, the cost is negligible. A trademark is a legal document that protects your brand from counterfeiters. It’s a one time cost, too. 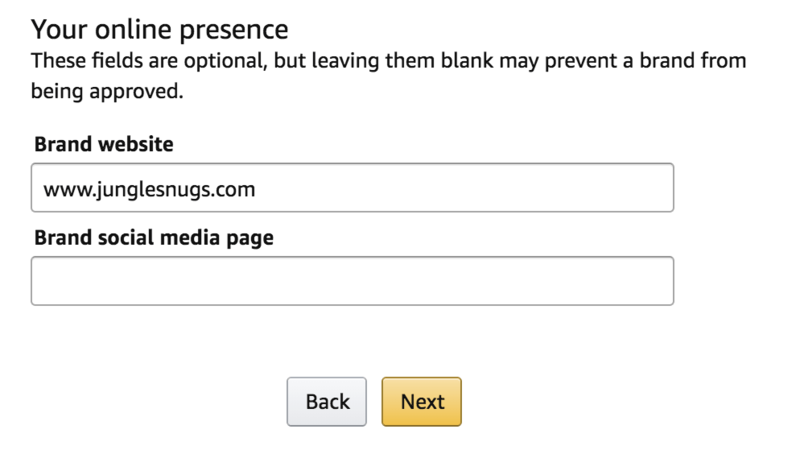 Not only does it protect your brand, but it gives you access to some of Amazon’s special features. Right now my first products are in production and I’ll start selling in 3/4 weeks. I was wondering if I could start a PPC or HSA campaign, withouth the Brand Registry. I won’t register my brand yet, but I really want to know if this is going to be a problem for my product launch strategy. If you have any experience with this, I’d love to hear from you. For HSA, you’ll need to have at least three products. However, you can do PPC without brand registry and only one product. Thank you for the fruitful information. Can I register a trademark in Australia and then apply for Amazon brand registry in USA? I want to sell in amazon.com and have the brand registry there. I’m planning to start selling on Amazon and I’m having a difficult time understanding the process of getting into Brand Registry and start as a Private Label seller. So my understanding is as follows. Brand registry requires brands to have a registered trademark. However in order to apply for a trademark I must have sold a product with the logo or mark. Therefore I need to start selling products with my brand but without entering the brand registry. I see several issues. I can’t get/control my own page (because I didn’t enter the brand registry), and anyone could register a trademark with my brand before me. This is in addition to the issues you had mentioned: protecting your brand against hijackers, counterfeit products or people using your brand name or logo. Is my line of thinking incorrect or missing anything? How can I start and avoid this situation at the same time? It’s pretty rare that anyone would sneak in and take your trademark. In fact, I’d go as far to say that it’s probably not worth the effort. As far as hijackers go, usually they aren’t an issue unless a) you run out of product or b) your product looks like every other product on Amazon. Kym. What about products where you can’t put the branding on the actual product?. That’s a good question. I’m almost kind of curious as to what you’re talking about since I’m not sure what products wouldn’t have space for a logo/branding. At the very minimum, put branding on the packaging. Honestly, the most responsive and attentive company in a FBA Amazon area for newcomers.Thank you,god bless you. “”This means that for sellers looking to sell in the US and then move to Europe, it may be more beneficial to register a trademark in Europe, because this will allow you to access the brand registry in the US and in Europe. Something worth considering before you make an application!”.. if i apply trademark in Europe i’ll be acceptable in us trademark too.Am i right? 2)Sorry my second question is i’ve watched all Case Study they were on of the most comprehensive tutorial on Youtube,so do i need any course to take for complement this videos.there are lots paid courses out there which costs for example 1000$ or ..
My product is being manufactured in China as we speak – thanks to Jungle Scout I found a good product to private label! I applied for UK trademark to sell on amazon.co.uk and being in the brand registry. I’m using 3rd party legit UPC codes. The barcodes has been generated and sent to the Supplier to print and label the OEM packaging. If I do get the trademark and would like to opt for no UPC but manufacturer parts number what do I need to do? Will amazon create new barcodes based on the parts number? Can I use the current barcodes? Will I have to redo my listing? Will I need to send a new barcode to the Supplier? Great questions! And honestly, I’m not entirely sure. 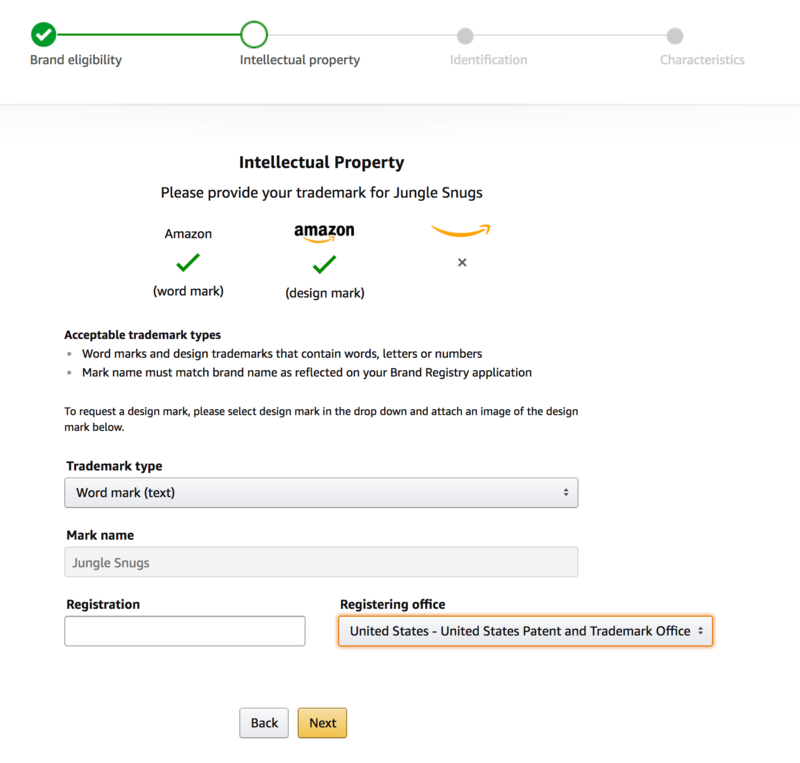 You might try sourcing one of our Amazon business specialists over at JungleMarket.com where they can help with some of the more nitty-gritty elements of trademarks and UPCs. Hope that’s helpful! Is there a video or direction to list a new product as a new seller using the Verified GS1 barcodes. I just had samples made, don’t want to spend on a trademark yet, but need help with the process for listing without 3rd party UPC codes and for labeling my products. 1. We are Canadian sellers and will be representing (selling) someone else’s Brand. Can we complete the Brand Registry application on behalf of the Brand owner? 2. 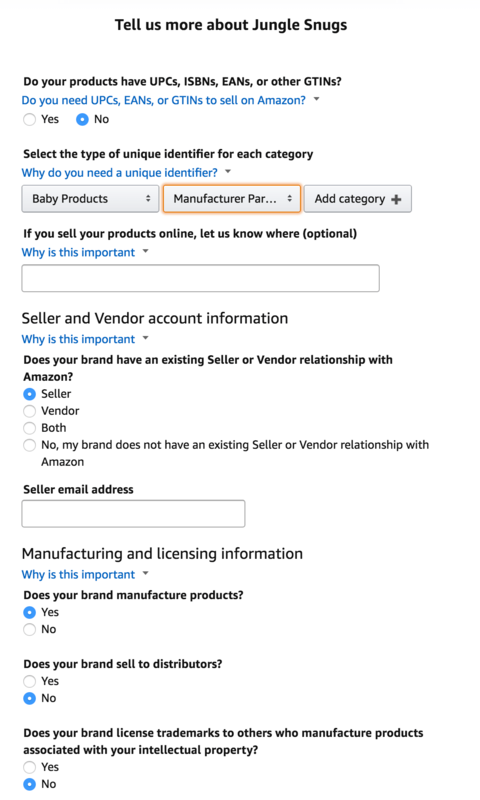 Once the Brand is approved on Amazon’s Brand Registry, is the Brand owner able to get sellers that haven’t been approved by them off the listing? And will Amazon help to enforce this? This is a great question. I am not actually sure if you will be able to complete brand registry on behalf of someone else’s brand. There is definitely the option in the application form to submit different levels of ownership (i.e. manufacturer or not)… but if the Trademark is registered to the Brand Owner, rather than your business, it might cause issues. I would advise speaking with Amazon Seller Support on this matter to see if it’s allowed or if you need additional paperwork. Also this would only be possible if you are selling someone else’s brand as the only Amazon seller, and not sharing the buy box or selling wholesale alongside other third party sellers. Question: In this process there was no mention of a website requirement when registering for Brand Registry. 3. If website required, is a functional shopping cart required? P.S. As always, good practical information in this post! Great question. There is an optional field for website, and social media presence. Since our Stix and Snugs do have websites, I put those in to this optional field for my applications. I am not actually sure how much this will affect you getting approved but I assume it’s not a requirement. The websites we have for our products are simple one page product websites, without a functional shopping cart. Hope this helps, and thanks for your input, I have added in a screenshot and explanation of this to the post. Hello Kym, I am a fairly large seller on Amazon and have been since before brand registry was a thing. Looks like I am going to have to get a new name I can trademark then register. Will this effect my existing listing? I assume I can simply change my brand name in the title and the manufacture name on the backend and edit my logos. 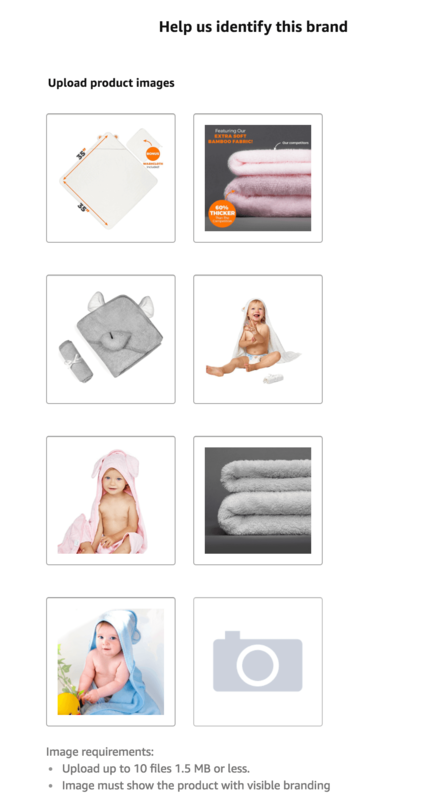 I have hundreds of products which all are of the same category. What about my UPC codes? They were also established before Amazon really cared about GTIN or a GS1 barcode. I don’t own my GTIN I am using a number(s) from a 3rd party supplier but it is legit. If you have lots of products in the same category then that does make things slightly easier. You could just register one “generic” brand name for all of them. But yes you will need to show this brand name on your products, listings and packaging. You should still be OK to enter the Brand Registry with photographic proof of this, even if your inventory still shows the older names/logos until you phase it out. If your products are already up and running using third party UPC’s then I wouldn’t worry about it right now. There is a chance Amazon may ask sellers to change to legitimate GS1 barcodes in the future I suppose, but they aren’t doing it right now. Only sellers creating new listings are running into issues at the moment. 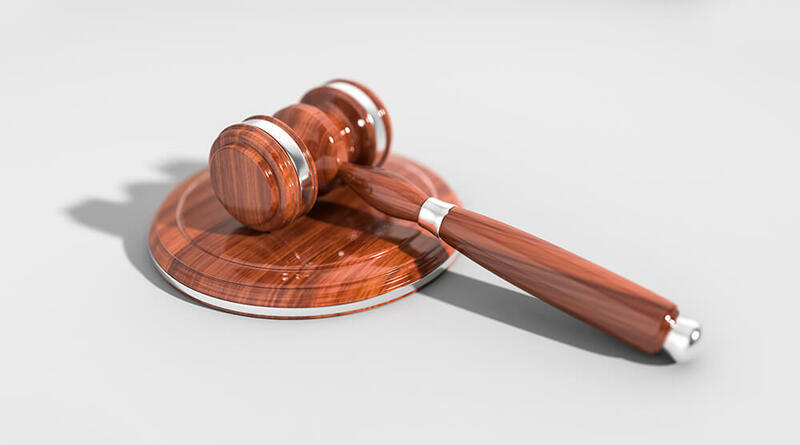 If you do get a trademark and enter all of your products into the Brand Registry then you can actually get rid of your third party barcodes all together and use a manufacturer part number as shown in this article. really interesting this topic.I have just started the procedure for registering my brand in the UK. In the future I would like to do it for all of Europe. However I followed the procedure as you explain above and I hope to get information about it as soon as possible. We are a record label with deals in music industry and fashion, and I would like to sell in the musical instruments and clothing category, but after following and getting your suggestions through webinar and video format, I am finding it difficult to find the right product according to the criteria of profit that you suggest, and then I will be forced every time to register the brand for the category for which I would like to market a product with excellent profits different from our main categories? it is correct what i read? Thank you in advance. Since Music/Fashion are categories you know, consider the things that you’ve used in your life and find ways to improve upon them. That’s how a lot of great products start. In the Genius Series this week, I’m covering how to come up with product ideas and carve out a market niche, even in a highly competitive market. Another great sharing! Thank you! May I know how long you got the brands by Trademark Engine? At present I’m launching a product on Amazon and plan to run a PPC campaign for it. I’m new to Amazon and don’t have a brand. I’m afraid it will be the target of those Hijackers as soon as the listing get a good ranking. But even now I apply for a brand immediately, the whole process is long. Should I keep quiet during the process time? Just do nothing and waite for months? Yeah unfortunately it does take quite a while. This is the same for all trademark applications (all over the world). Ours took around 4 months to come through and be approved as registered trademarks. In the meantime, we were still selling the product without brand registry. I would highly recommend that you do not wait wait around to get a trademark to launch. After all, you want to start getting those sales in, increasing your rank, and improving your listing. If your Trademark takes a while to come through, that’s months of revenue you can still cash in on. Sure, hijackers can be a threat, and yes, it might be more difficult to get rid of a potential hijacker. But it’s always worth getting started because the longer you wait to launch, the further away you will be from having a product listing than pulls in organic sales. Thank you so much, Kym. Your words make me more confident! Do you think it’s a good idea to buy a existing trademark? Or rent from others before I get my own trademark after 4 month? If so, do you have any recommendation? I actually don’t know anything about buying existing trademarks – so I can’t provide any insight there. I would imagine that renting a trademark from others is not legitimate / against TOS. But whether you can buy out an existing one legitimately I do not know. I would highly recommend our FB group. I often ask questions in here and the community is awesome at answering all sorts of specific questions. Hello Kym, thank you for the post! very interesting and very well explained. Unfortunately, that’s one of the side effects of using a deal site to amp up new products is that OA sellers will jump on your own listing. It’s super lame, and you’re right… Amazon won’t do anything about it unless you have a trademark/brand registered product. All you can hope to do right now is wait for them to sell theirs or purchase it from them at their list price. To get the buy box, you’ll need to have the lowest price available.